Siamak Zahraie: "Black Lives Matter", What is it? Is there racism in the U.S. particularly against black Americans? Yes, there is and there is more of it than meets the eye. The crux of the matter is in the last part, there is more racism than "meets the eye". The BLM movement focuses on the outward appearances of events that might point to a racist behavior, which at times could be true and at times could be false. Dozens of videos about police violence that circulate the web is the foundation of this movement. BLM points to these videos as the evidence to the reality of the racism. Among these videos, and I have seen many of them, I have not yet seen a video to be a clear cut and a definite testimony to the racism in the law enforcement units. Is my observation an indication that racism does not exist? Not at all! What I am saying is that these videos fail to prove racism in the law enforcement units and emphasis on them hides the racist trends that do exist. Focus of these videos on scenes, as horrific as they are, do not define the racism in the U.S.
BLM found its momentum on the heel of these videos, depicting arrest or shooting of black suspects. 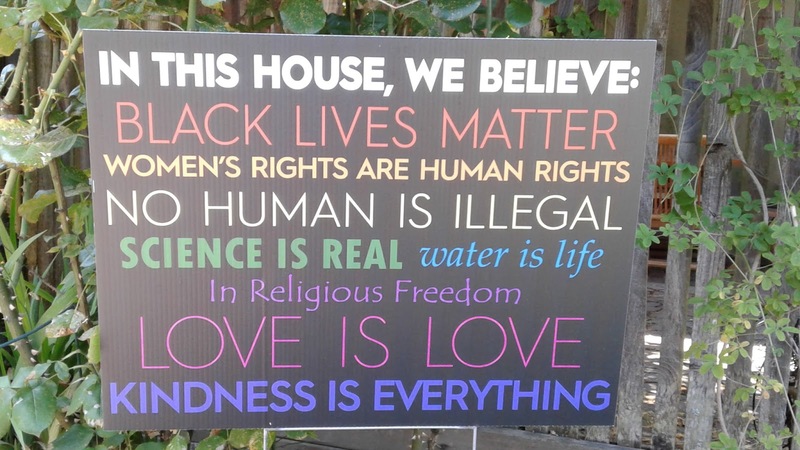 I can see part of this momentum in the front lawn placards, at least in my neighborhood in Seattle. These placards endorse whole host of slogans: "No Human is Illegal, Science is Real" etc., and at the top of them declaring "Black Lives Matter". Am I going against the prevalent wisdom of my neighbors? It seems so, but bear with me. All those slogans have an ill-defined leftist bent to them but in this post, I will only focus on the “Black Lives Matter” slogan. When I tell my friends that BLM is a frivolous movement, they get shocked as if a "racist" vibe has filled the air and it should be dampened or hushed immediately. I am usually tone deaf to the popular wisdom. So, I probe further by a follow up question, "can you tell me in one sentence what law you would enact or change to address the BLM movement's concerns". They look at me with bewilderment, they do not have an answer. I ask my friends "OK, a sentence might be too short for you, can you explain that law in a paragraph, a page, or a chapter. Do you even have an idea of what needs to be done”? They simply get stumped. I don't believe anybody can define a legal goal for the BLM movement. When Rosa Parks, in 1955, sat in a seat in the front rows of the bus. She was violating the racial code in Alabama at the time, but her legal challenge was simple. She was demanding the abolishment of the racist code that assigned black citizens to the back of the bus and gave preferential seating to the whites. While she was clearly on the right side of the issue she did not fight the police, or create a confrontation during her arrest. Fighting the police would have undermined her clear goal. Don't you find it strange that almost all the BLM videos contain some form of physical confrontation with the police. The bus boycott movement was not frivolous because it could clearly be translated into a legal code. The same went with the civil rights movement, it had a defined legal goal. It was addressing the voting rights for the blacks and the elimination of the discriminatory laws. Why BLM cannot define a legal goal for its protests? I believe this lack of a clear goal makes it a frivolous movement. This brings me to my second assertion that this slogan, "Black Lives Matter", is a dream come true for the leftists. I am quite familiar with the leftist ambitions; my political background was deeply rooted in the leftist politics. The leftist strategy has been and is to convince the population that there are a whole host of fundamental issues that our present social organization, "capitalism" in their jargon, is incapable of addressing. For them the social "position", the "status", of blacks is such an issue. The "Black Lives Matter" movement does not have any practical proposals to address the racism embedded in our police units which impacts the lives of the black members of our society. As a substitute position they presume that the U.S. has reached a dead end. This presumption goes back some 100 years ago. They believe that the U.S. is fundamentally a racist country and irredeemably will remain so. The leftist goal is not a reform or a legal change, but their goal is a revolution. They do not like reform movements, an attainable legal goal, they prefer to create irreconcilable confrontations which will lead to a revolution. That was their strategy and method throughout the civil rights movement after the WWII. The leftist organizations came around the civil rights movement with the purpose of convincing the movement activists that without a revolution the aspirations of the blacks in the U.S. are unattainable. They were even certain that the "ruling class" would not permit the election of a black president. The leftists preferred Malcolm X's "by any means necessary" method to the reform minded civil rights movement of Dr. Martin Luther King. For them civil rights leaders were sell outs. These leftists were proven wrong on all accounts. The civil rights movement reached its legal goals and from its social gains a real black middle class grew out, with lawyers, doctors, engineers, scholars, scientists and CEO of major companies and even a black president for two terms. Without a clear legal goal, the BLM is a tool for confrontation as we have been witnessing particularly on our college campuses. I presume that most of my neighbors are not leftists, but their good intentions only play itself to further the goal of the BLM leftists. Popularization of this slogan gives a cover of middle class "moral" weight to the intentions of the BLM leftists. It affirms the leftist dream of portraying an irresolvable issue, which this slogan fundamentally is. How does the BLM hide the actual racism? Let's look at one of the well-known cases that seemed to be one of the most "egregious" violations by a police officer, shooting of Walter Scott in the back by officer Michael Slager in N Charleston, S Carolina. If you have not seen the video I have the link in the previous sentence. It looks like an unprovoked example of a white officer shooting a fleeing black man. Then take a look at this documentary about the work of Daniel Voshart, who is from Toronto. This documentary shows that the fast pace of the video showing the shooting does not convey the events accurately and the story is more complicated. I am not trying to sort through the complications. I would not be able to. If we put aside these complications does this video prove a "racist" behavior by officer Slager? Let's assume the fast pace of the scenes presents the reality of the encounter and that is all there is to it. Let's assume that officer Slager did not have any excuse or legal cause to shoot Walter Scott. Let's assume Slager's act was criminal. Does it make Slager a racist? Could it be that Slager was so full of himself and he thought that he could shoot anybody that does not obey his command. That could certainly be a possibility. There is nothing in that video that excludes this possibility. All I am saying is that from a single video we cannot conclude that Slager had racist motivations in his action. BLM supporters can retort back that there are lots of videos about police shooting of black men. The fact of matter is that as many videos that BLM supporters could collect and distribute, and there are not that many of them, there is only one video about Slager and you cannot pin racism on him even if he has been acting illegally. Slager could very well be a racist but that single video does not prove it. If Slager is a racist, this characteristic of him can only be traced from a collection of his daily activities and his repeated interactions with the black members of our society. If there was a pattern one person should have known of his presumed racist behavior and that person is Slager's supervisor. His supervisor is the one who monitors Slager's interactions with the members of the community. If there is a racist pattern Slager's supervisor is the one who knew about this pattern and was not doing anything about it. So, if there is racism, one must look for it in the hierarchy of the police units beginning with the police supervisors. Focusing on the individual videos as the evidence of racism, BLM hides the culprits behind the scenes who hire and retain racist officers and in a sense nurture it. And this is my point, that in fact BLM diverts the attention from the entrenched racism, the actual racism. BLM prefers a slogan on a stick than looking for rules and legal remedies. Can there be remedies? I believe so, we have examples of it in other enterprises that provide a service. If you talk with a bank representative, first the conversation could be recorded and monitored, but as a matter of rule you get a call or an email asking you to rate or comment about the service that the bank rep had provided. Why can't this same method be extended to the police officers. They are providing a service as any other profession. The method could be simple, every interaction of an officer, which has a legal nature, with a member or members of the community could generate a case number where the members of the community associated with that case number would have the opportunity to provide feedback to the police unit. Compilation of these data can show the patterns of discrimination, lack of performance or racist attitudes which then needs to be dealt with. This collection of data need to be open to the researchers who are interested to study and monitor the police behavior. Would BLM activists be interested in promoting such programs? I doubt it, for one reason, taking steps to promote such programs will take time and will cut into their task of carrying slogans on a stick to prove their “revolutionary” strategy. And my dear neighbors are helping them in their endeavor. Why do I think that the leftists are complicit in the racism that lurks in our police units? One of the characteristics of the leftists is to look at the police officers as evil members of our society whereby they should be avoided. A police officer can be a member of any political party, Democrat or Republican or any other party, except they are excluded from the leftist parties and organizations. The leftists look at the function of law enforcement as having a subservient role to the "ruling class". They believe that law enforcement is only the tool of this “class” and this force should be fought off at every turn. This ideological premonition tilts the police force and its recruitment practices toward the recruitment from a milieu of more rightist politics and as such it is bound to be influenced by racist attitudes. In a democratic society, law enforcement and security are social functions like any other social functions. This requires that we would be receptive to cooperate with it and at times participate in those functions, like any other social functions that are necessary for our society. Leftists by ostracizing this function help the racist tilt in our police force organizations. This complicity is embedded in their ideology. They are complicit. Does the display of the “Black Lives Matter” slogan promote the safety and position of the black members of our society? I do not think so, it only promotes the psychology of victimhood with an aimless confrontation. Think of it this way, a sign on my front yard saying that “My Neighbor’s Life Matters”, whatever the color of the skin of my neighbor, is this sign an indication that I am promoting the safety of my neighbor? No, it is not. 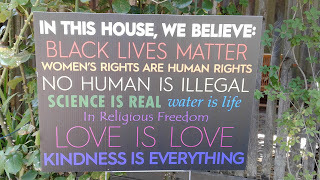 The only sign in my front yard, if I ever needed one, that sign has to say that “My Life Matters”! If by some chance, I lost my marbles and felt that my life does not matter, that is the time, that all my neighbors should be really worried about their lives. Is this not the case with the mass shooters? They lose the sense of the importance of their lives. Their lives do not matter to themselves any more. It is this senselessness that prompts them to take as many lives as they can before ending their own. We might want to be Holier than thou, but at the end of the day it boils down to the attitude of one to his own life. Rosa Parks acted as “her rights did matter”. Her choice to sit on any vacant seat on the bus did matter. What she did was simple but clearly represented the demand for instituting her rights. Promotion of these videos without any concrete proposals only promotes a mentality among the black youth that as if “their lives do not matter” and as such they need to entangle with the police personally! And that is dangerous and counterproductive. The confrontation with the police is what you can clearly see in almost all these videos that are promoted by the “Black Lives Matter” movement. And that is what Rosa Parks did not contemplate and did not do, as if she was saying to herself “My Right Matters”!